The wind was blowing strongly. I was feeling a bit tired, but what really took my breath away was the beauty of Bohemian Switzerland National Park, not the hiking itself. When I heard about Bohemian Switzerland I didn’t know exactly what to expect from this northern region in the Czech Republic. I was prepared for rock formations, forest, and viewpoints, but our two days hiking in Bohemian Switzerland were more than that. We were awed by the stunning nature, warm people and delicious food. Bohemian Switzerland National Park was our third stop in the Czech Republic. We started our trip in South Moravia region where we visited Brno and the castles nearby. Then we traveled to Liberec, a paradise for winter sports. Now it was time to explore the forest, go out of the beaten path and see some unique places in North Bohemia. The Bohemian Switzerland National Park [České Švýcarsko in Czech] occupies a huge area that transpasses the country border and stretches to Germany, where it’s called Saxon Switzerland National Park. In the Czech Republic, the park covers an area of 79 km2 and 97% of it is still covered by forest. The geologic formation is the main attraction of the Bohemian Switzerland National Park, followed by the diversity of animals and plants. There you gonna witness nature in its pure form. Beautiful canyons, sandstone towers, rocks rising from the green forest and lookout points that will leave you speechless. Not to mention the cute villages, some castles, and rivers. The idea is to be surrounded by nature and hike to the best viewpoints. But don’t worry, it’s a feasible outdoor activity. 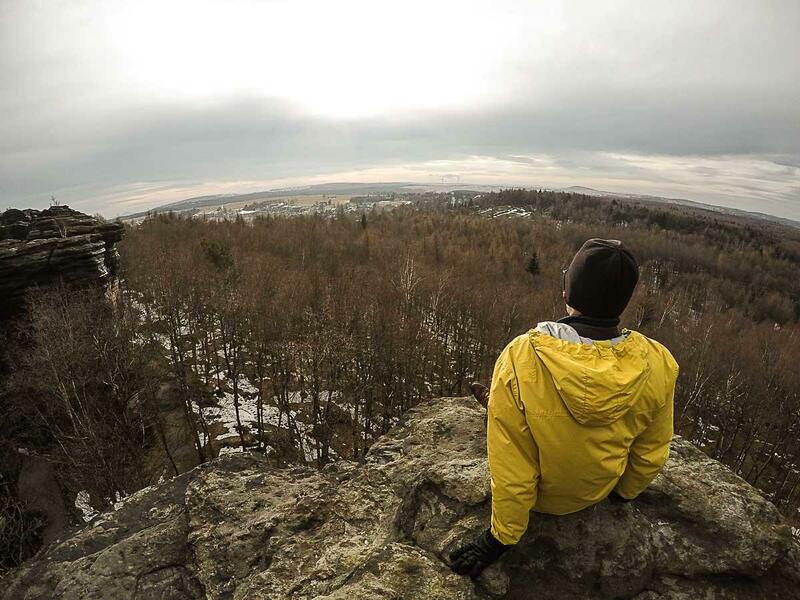 To enjoy the natural park you don’t need to be a super hiker. That’s why Bohemian Switzerland is one of the best hiking in the Czech Republic, it’s beautiful and most of the people can do it. Below you gonna find all the information you need to visit Bohemian Switzerland National Park on your next trip to the Czech Republic. Located in the north of the Czech Republic, you can travel to the park by train or bus. As we were traveling inside the Czech Republic by train, we used our Eurail Pass to travel from Liberec to Varnsdorf, the closest train station to Dolní Chřibská, the cute village where we stayed. If you come from Prague then take a train to Děčín and from there you can go by bus, taxi or car to the small villages close to the hiking trails. If you want to travel in the Czech Republic by train, read our blog post about how to travel with Eurail Pass, how to have freedom and flexibility while saving money. You can buy your Eurail Pass here! If you prefer to travel by bus from Prague to Bohemian Switzerland National Park search for the best route and timetables here. 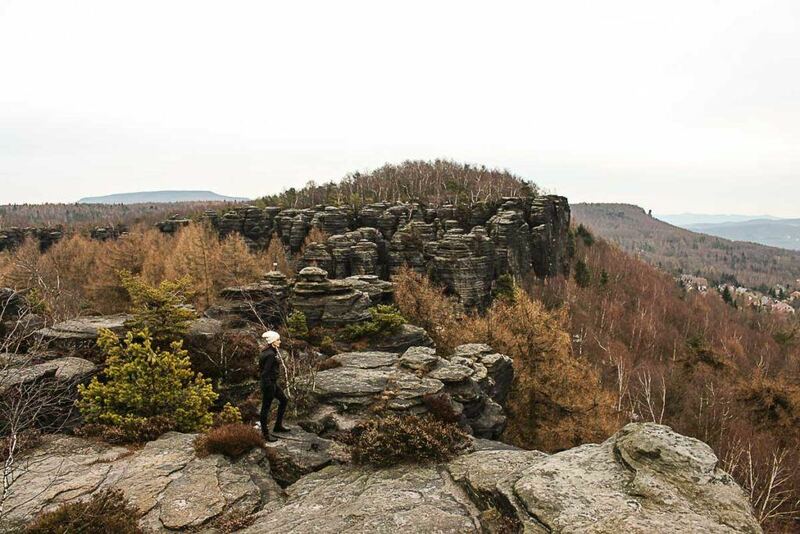 Hiking the Bohemian Switzerland National Park is one of the best day trips from Prague. Many travelers book a day tour that covers the transportation from Prague to Bohemian Switzerland and the hiking experience. We gonna talk about hiking tours later on, just keep in mind that if choose a good tour you won’t need to worry about transportation from Prague to Bohemian Switzerland. 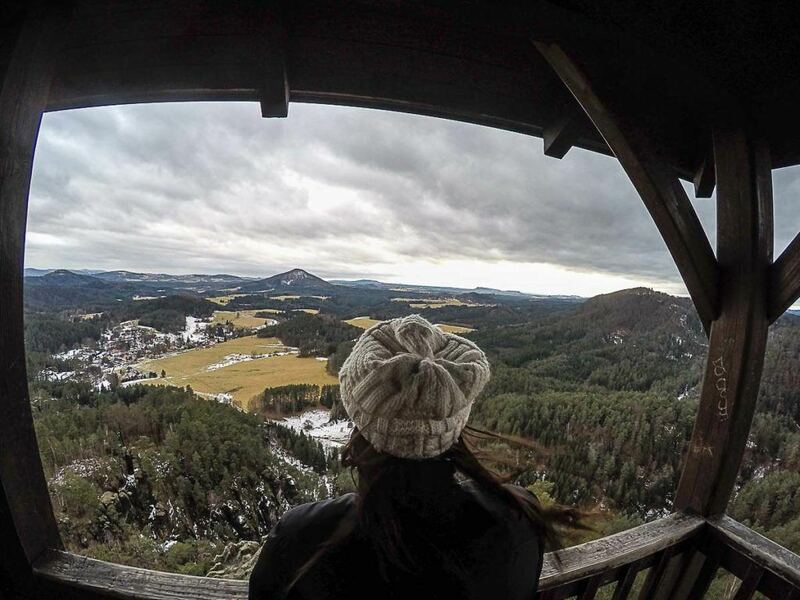 How many days should you stay in Bohemian Switzerland? The answer is easy, you should stay as long as you are having fun! But I totally understand that for many travelers it’s possible to stay only one or two days, as they need to keep exploring other places in the country. We stayed two nights in Bohemian Switzerland and I believe we had enough time to see the main attractions. But to be honest, I think 3 nights would be even better. With almost 3 full days you have plenty of time to do the hikes, visit the local villages, cruise de canyons and eat delicious food. If you can’t stay that long, my suggestion is to plan your itinerary wisely and book a good hiking tour in advance. So once you arrive in Bohemian Switzerland National Park you won’t need to worry about anything, just enjoy the beautiful landscape. Hiking the Bohemian Switzerland National Park is a common day trip from Prague. In less than 2 hours you can reach the park the car by car, explore the park during the day and go back to Prague for dinner. 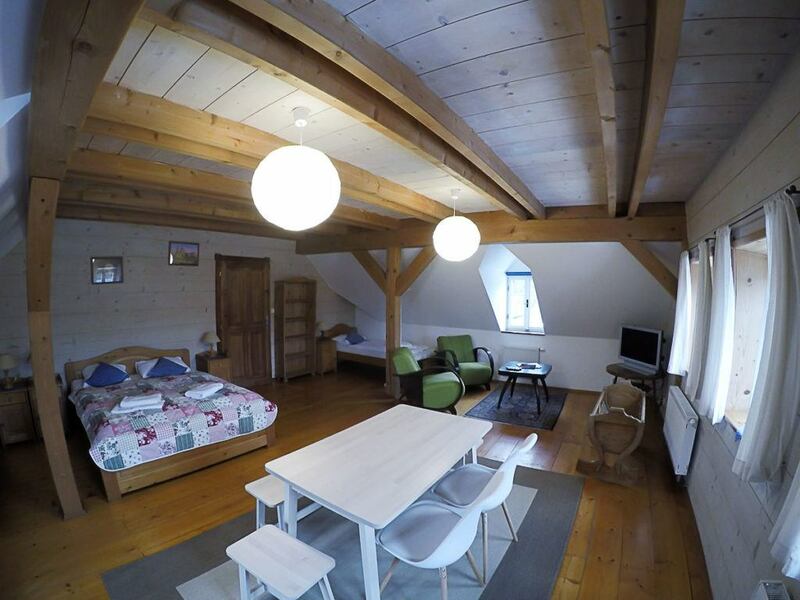 If you decide to stay more than one day in Bohemian Switzerland you must sleep in a local Bed & Breakfast. Děčín, Hřensko, Jetřichovice or Dolní Chřibská are some of the villages near the park that have good options of hotels [click on the name of the villages to book the best hotels in Bohemian Switzerland]. 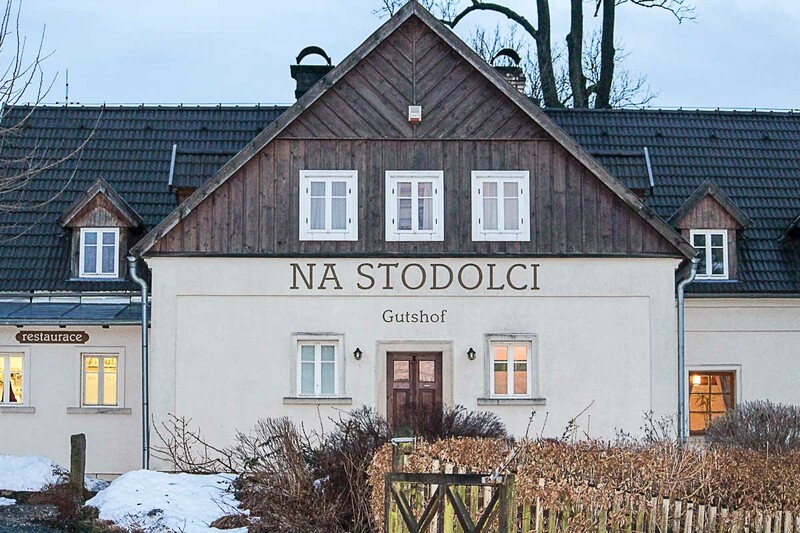 We stayed at Na Stodolci, a family-run pension located between Chřibská and Jetřichovice. Na Stodolci is a lovely property that offers more than rooms. You get that warm feeling of staying in a family house, with home-cooked breakfast, local beer, and a restaurant to die for. The room was huge, with a private bathroom and a super hot shower. Perfect to recharge our batteries after a long day hiking in the Bohemian Switzerland Park. It’s a little farm, where you can play with cats, horses and taste the Czech countryside life. We were there during winter and the fields were covered with snow, turning the landscape even more beautiful. During one afternoon we saw reindeer and wild habits running freely near the house. If you decide to stay in another hotel, you must stop by Na Stodolci Restaurant for lunch or dinner. The restaurant has been nominated one of the best in the Czech Republic for the past years, and I can guarantee the food will be delicious. Local recipes made with fresh ingredients and cooked to perfection. Everything we ate there was gorgeous. Not to mention the beer that is made in a local brewery and arrives fresh almost every day. You need to eat well to have energy enough to hike the trail in Bohemian Switzerland. But this won’t be a problem, on the road that leads to the park many restaurants are serving delicious local food. Apart from Na Stodolci restaurant, another place we ate and loved was the U Fořta Restaurant, that is also a local hotel close by Hřensko village. 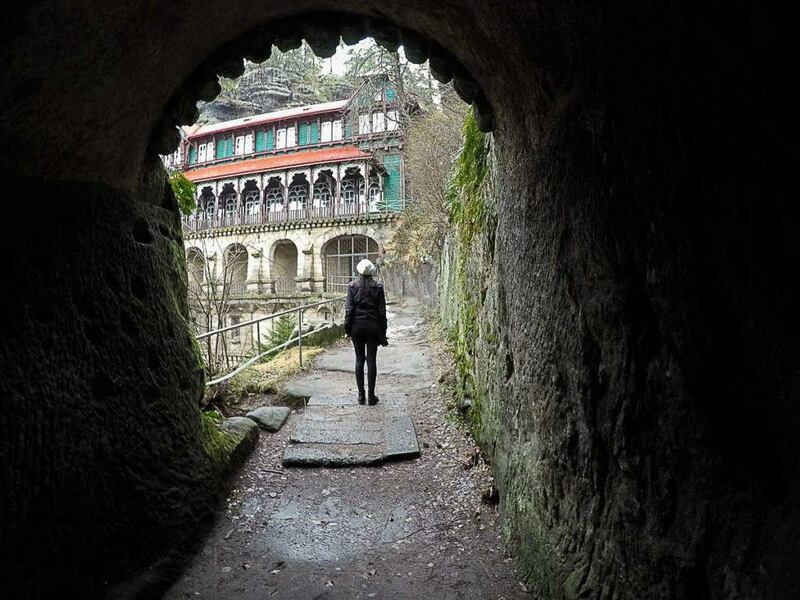 The Bohemian Switzerland National Park is open to the public all year long, and you can visit it by yourself, without a tour guide. But before you venture yourself into the wild, let’s think about your capability to hike the Bohemian Switzerland National Park without any guidance. Are you an experienced hiker? Do you know how to read the trail marks and find yourself in the middle of the forest? Do you know how to climb? 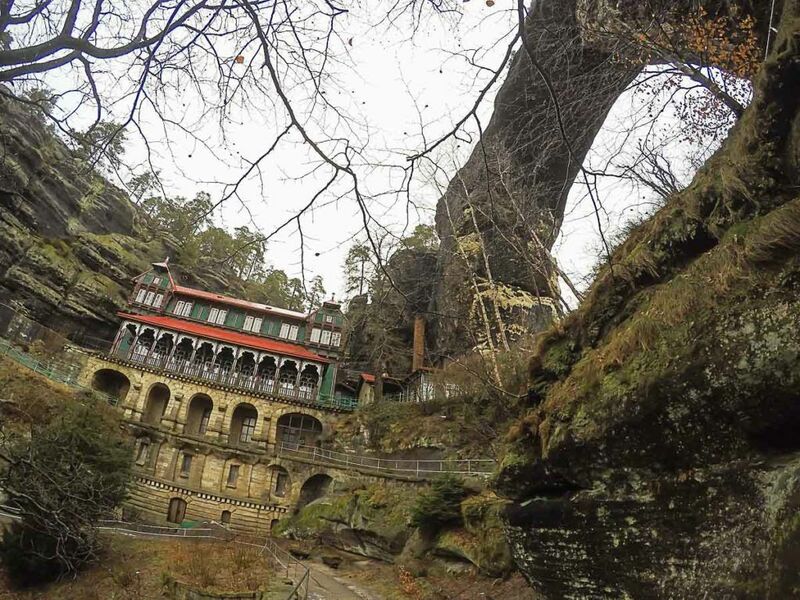 Do you know the rules of the Bohemian Switzerland National Park? If you said yes to all the questions then you can take the risk and enjoy the national park by yourself. But first, make sure to stop by the Information Center located in Jetřichovice village. There you will get updated information about the park, the trails that are open to the public, if there is any concern regarding the weather and also get the maps. If you said no for most of those questions, then we are in the same boat, hiking enthusiasts that need professional guidance. And I believe this type of outdoor activity is better when you have a guide. Someone that can share with you information, stories and give you a local perspective of the place. In the end, you are not only hiking, but discovering a new travel destination, learning about nature and how to protect it. We did our hiking tour with Northern Hikes and I’m sure we couldn’t have chosen a better company. They organize different day trips from Prague to Bohemian Switzerland National Park. You can choose the itinerary that suits you better, considering the distance of the hike, the number of attractions you will visit or even if you want to cruise the river in the park. As we stayed two days in Bohemian Switzerland, we did 3 different tours. One sunset hiking in the first afternoon, a morning hiking in the second day, and in the second afternoon we visited the Tisá Rocks Labyrinth. The company has group tours or private hiking experiences. We did a private tour and felt like having fun with a friend. We arrived in Bohemian Switzerland after lunch, just in time to drop our bags in the hotel and get ready for our first hike. The idea was to start our first hiking in Bohemian Switzerland at Jetřichovice village, were we faced some icy pathways until we get deep into the forest. The hike from Jetřichovice to Mariina Skála [the first lookout point] was a really easy. A trail of almost 2 kilometers [round trip], it was clear and not so steep. The hardest part was to climb the stair at the top of the rock formation at 428 meters above sea level. But the effort was rewarded with a stunning view of the national park. The perfect way to start our hiking adventure in Bohemian Switzerland. We were doing our hiking in the Czech Republic during winter time and the weather changed a lot. We didn’t get clear skies but the heavy clouds made the national park even more mysterious and unique. We did the first walk pretty fast so our guide offered to lead us to another viewpoint, a bit further on the trail, and of course, we said yes. We hiked from the Mariina Skála to Vilemínina Stěna lookout point. The second hike was a short trip of 1.7km and another easy trail. On the way, we passed by an interesting rock formation that through the years has been used as a shelter. During the whole afternoon, we were surrounded by gigantic trees and we could hear the water dripping from the huge sandstone walls. While I was soaking all the beauty our guide was explaining the importance of protecting that area and how unique is the geologic formation there. Our first day hiking in Bohemian Switzerland National Park was a success, we did almost 4 km of a moderate walk with stunning views. 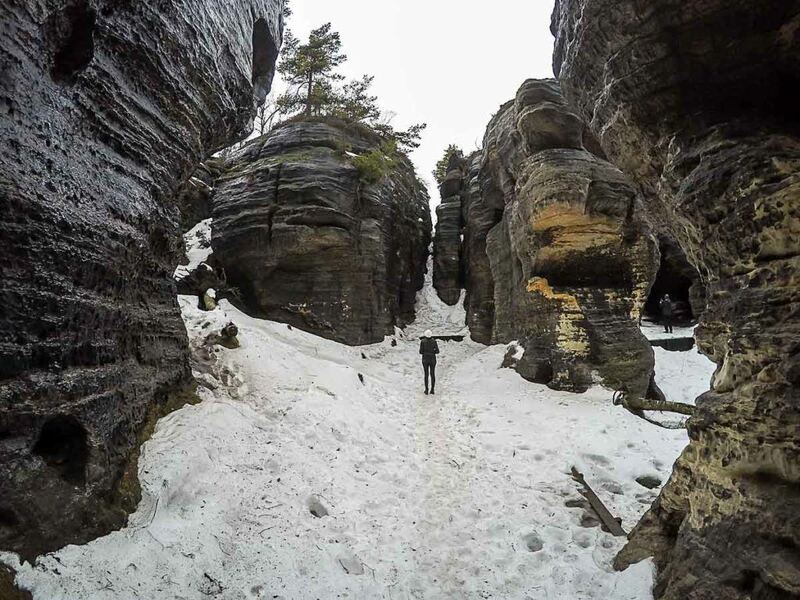 The good side of doing the hiking tours in Bohemian Switzerland in winter time is that there are almost no one on the trails, you can have the park only for you. On the other hand, we didn’t cruise the Gorges of Kamenice, as it was closed because of the weather. If you book a tour during spring or summer time you can enjoy this scenic dinghy ride. After a delicious dinner and a good night of sleep, Rob and I were ready for our second day of adventure. At 9 AM we started our second hiking in Bohemian Switzerland. Our guide stopped the car close to Hřensko village and we hiked to the famous Pravčická brána, also called as Pravčická Gate. 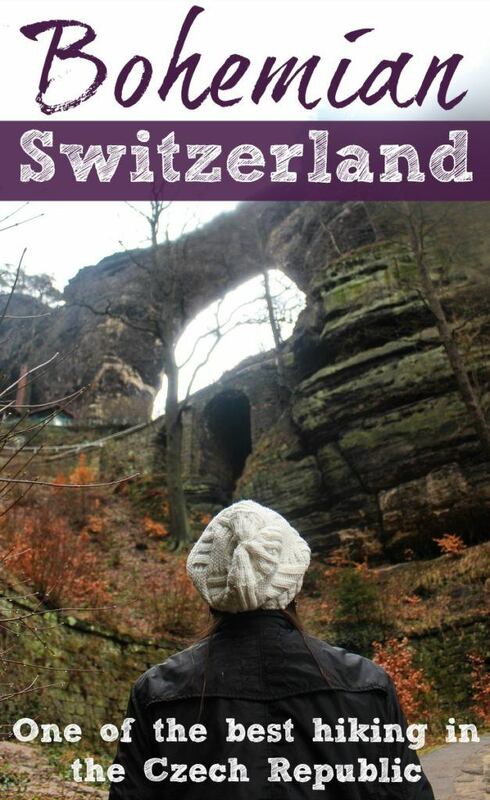 It’s the largest natural stone bridge in Europe and a natural monument in the Czech Republic. The largest rock arch has 26 meters of length and 16 meters height. It’s impressive! Beside the Pravčická Gate there is a chateau known as the Falcon’s Nest built in the 19th century. The morning hike was a bit tough, not because of the elevation or the trails, the path was very clear and easy to walk. We faced some rain what made the experience a bit chilly. But again, totally worth it! 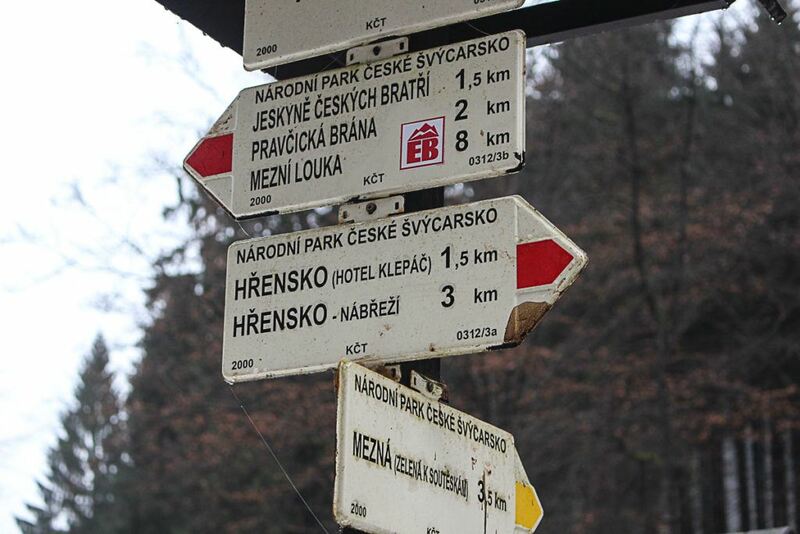 The round trip to Pravčická Gate took almost 6 km, and again we had the hiking trails only for us. Amazing!! After the hike, we stopped for lunch, a good Goulash soup to warm up and some local beer to celebrate our hiking in Bohemian Switzerland National Park. We couldn’t waste time in such a stunning place, so as soon as we finished the lunch we hopped in the car to drive to our next hiking destination. On the way, we saw many icicles growing on the rocks, and if we had a better weather we could go visit an icefall, a beautiful frozen waterfall. 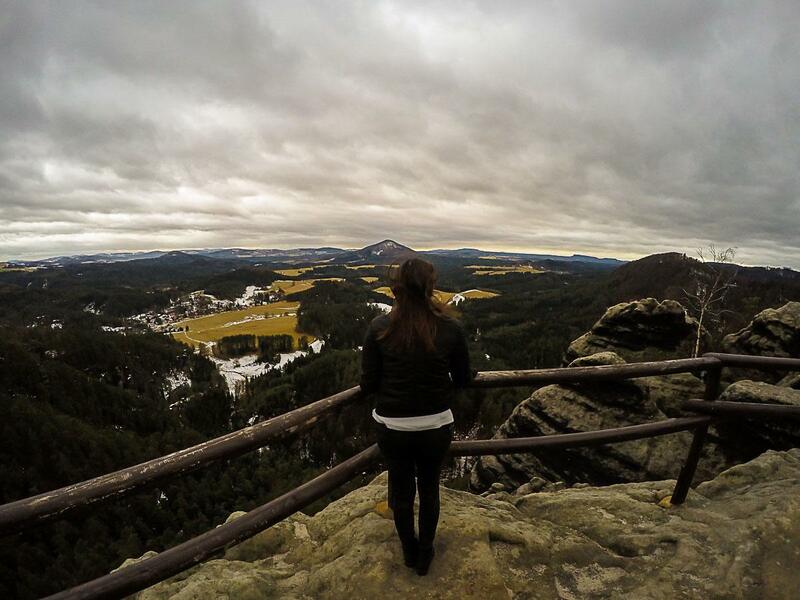 Our third hike in Bohemian Switzerland was on the Tisá Rock Labyrinth, a preserved area located near Děčín town. It’s a place where you can get lost in the middle of bizarre rock formations, little caves, and holes that have been transforming this area during centuries. It’s a labyrinth, a magical place with a hidden surprise in every corner. There is a hiking trail in Tisá Rock Labyrinth that starts from the church below the hill and go to the lookout points at the top of the rock towers. It’s an easy walk, the only problem was the snow melting on the trails, we had some slippery moments and even silly falls. Nothing to worry about, only to laugh. You might find the Tisá Rock Labyrinth a familiar place. The sandstone labyrinth was one of the filming locations for Chronicles of Narnia. The Pravčická Gate was also in the movie. The Bohemian Switzerland National Park is a truly a fairytale place, perfect for movies and real life. In the middle of the afternoon the rain stopped, and as soon as we arrived at the top of Tisá Rock Labyrinth we had a clear sky and a kinda of sunset. Our two days hiking the Bohemian Switzerland ended in the best way as possible. Beautiful views, tired muscles and the feeling that we had visited one more amazing natural park. We conquered the unique Bohemian Switzerland, now we were ready to move to our next destination in the Czech Republic. If you are planning your trip to Bohemian Switzerland keep in mind that the access to hiking trails might change according to the weather. Also, the visit to the Gorges and the icefalls are restricted during certain periods of the year. 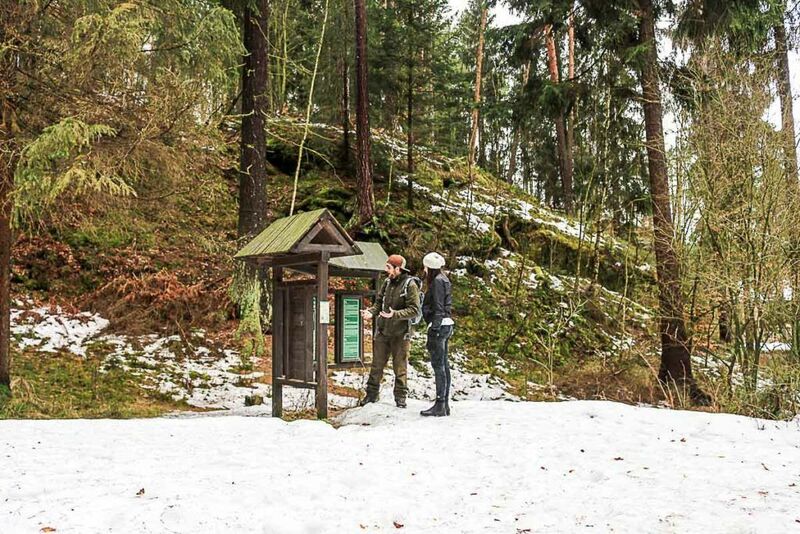 We visited Bohemian Switzerland on February, the snow was starting to melt and there was warning for floods. That’s why it’s super important to contact the park information center before you start any activity in Bohemian Switzerland National Park. Or even better, book a tour with a trustworthy company, as we did with Northern Hikes. 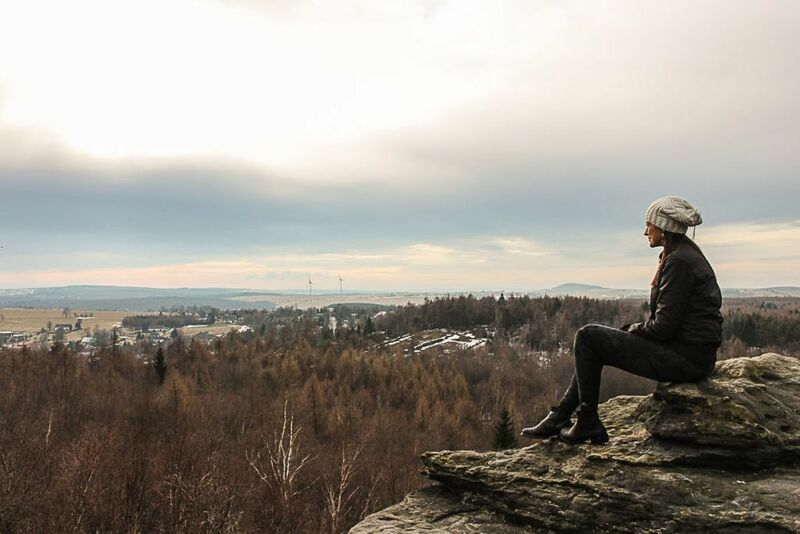 Enjoy your adventure in Bohemian Switzerland and don’t forget to visit other stunning destinations in the Czech Republic as the interesting Brno, the sporty Liberec, the fairytale Cesky Krumlov and Prague. Also, don’t forget your travel insurance, adventurous travelers need an especial coverage. We trust and recommend World Nomads to protect our health and our belongings. Do you like this post? Pin it for later!! Great write up of hiking in the Czech Republic. Here was always one of my favourite places to cycle through. Awesome to see that it’s popular for hiking as well! 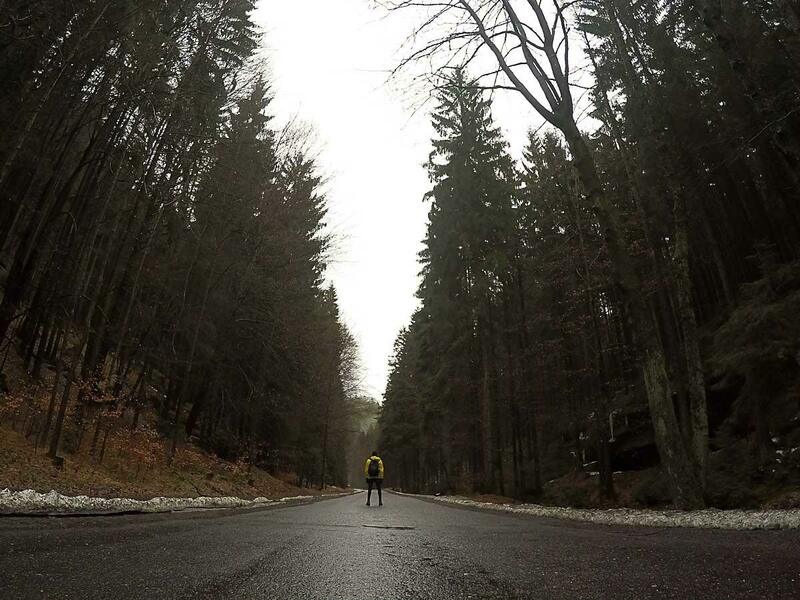 I’m glad you liked the post, we loved Bohemian Switzerland and I can imagine how fun must be cycling around that beautiful place. Tks for the update although the official tourism board still calls Czech Republic. Absolutely agree with Robson. When even us locals are divided on what we call our country, I don’t think there’s one right way. Czechia is now officially registered with the UN, but that’s about it. Czech Republic is still the official name or Czech Republic, and all the Czechs I know hate the the name Czechia. The Bohemian Switzerland is a beautiful place. I walked many trails there. From Hrensko to Pravcicka Brana to Mezni Louka and to Jetrichovice. Our country deserves better name than Czechia, it sounds more like the name of soccer team. The Czech Republic should stay the official name. But I’ve not been there before and would be grateful if you can help me with some questions below. Thanks! 1. Will there be lots of people during that time? From safety perspective, if i get lost will there be chance i could spot other hikers/guides for help? 2. Is the trail well-marked? Are the markers all along the trail, or just at major turning points? 3. Has there been anyone who got lost from the trail in the recent 5 years? 4. Is there mobilephone reception/coverage (voice/data) along the whole RED trail? Is there a specific mobile operator with the best coverage there? 5. The website says that the cost per adult is 100Kr. Are there any other costs besides a meal at Falcons Nest? 6. Should I buy the tickets and book any timeslots in advance? The boat rides in the Gorges? 7. In the gorges, can i ride both boat rides? Or i should only choose one because both boat rides go the same direction? 8. Staying there: I’m planning to drive there the day before and stay overnight. Then head out early for the hike the next morning. Is there a recommended decent place to stay close to the trail? 9. Are there any nearby attractions to visit, or on the way driving in from Prague city? Our hikes were organized by https://www.northernhikes.com/, since they took care of everything afraid we can’t answer all your questions. 1. We were there in March and saw only 2 other people on the trail. 3. No idea about it. 4. No idea about it. 5. Since we were with , they covered all the costs. 6. & 7. We didnt take the boat ride due to safety reasons, heavy rains when we were there. 8. Pls refer to the hotel in the article. 9. Pls refer to the article above.